“I’m not a political guy. I don’t really deal with Democrats or Republicans. I don’t find that funny. And I don’t talk about the gay community, be it male or female. No thank you! It’s such a sensitive subject. I’ve seen comics get into serious trouble by joking about gay people. It’s too dangerous. Whatever you say, any joke you make about the gay community, it’s going to be misconstrued. It’s not worth it. Obviously, I don’t think he should start insulting the gay community. However, he contradicts himself with his statement. Basically, he is saying that humor should not be politically correct and black women should learn to take their “lumps.” BUT the gay community is off-limits because he doesn’t want to get into trouble. But shouldn’t all folks be fair in love and war, since that is what he is arguing? Also, he doesn’t think he will get into trouble insulting black women? I find that interesting. I think a lot of black male celebrities know they can get away being offensive towards black women, because of our status in this racist/sexist society. I think a lot of black women have absorbed the anti-black woman/anti-black racism that is currently dominating the entertainment industry. Also, looking at the writer’s picture, she is not a very dark-skinned black woman. I think people do not understand the abuse and hostility very dark-skinned black women receive in this country. We don’t need an unfunny “comedian” trying to get his fame/project his low-self esteem on us too. 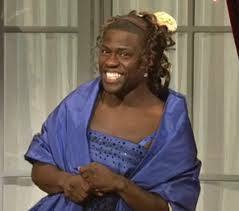 Hart mocks actress Quvenzhané Wallis on Saturday Night Live.